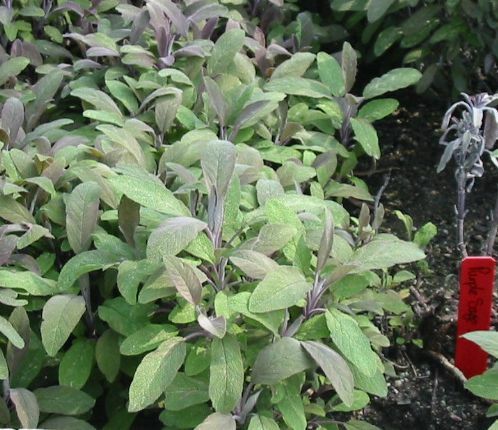 Sage is very slow to establish itself, so be prepared for a wait if you grow it from seed. 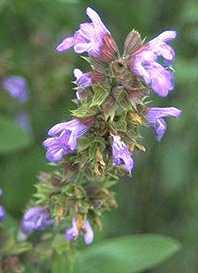 When established however, common sage is reasonably hardy and tolerant of almost all conditions as long as it receives a regular dose of full sun. It is well suited to growing in containers and will grow indoors if given sufficient light. Add to this the nicely textured velvet grey-green leaves and violet flowers and you have a herb or flowering plant well-suited to all gardeners. There are several varieties of sage with different coloured flowers and even variegated leaves (some fine for kitchen use), although none are as hardy as the common sage. Sage will grow almost anywhere as long as it is in full sun for a good part of the day. The best soil is a well-dug medium one, with a handful or two of bonemeal worked in twice during the summer. What sage does not like is soil that is moist all the time - it is a native of Mediterranean areas. Sage is sold at most garden centres in small pots - as long as they are purchased after all danger of frost has passed, they can be planted straight outside. This is the quickest and most reliable way to start growing sage. Make sure that a 90cm (3ft) is in place near the main stem - the plant can be tied to it as it grows. Sage can stand by itself most of the time, but the odd strong wind may snap the brittle woody stem. You should be able to pick a few leaves in July time if planted in Spring. It is more satisfying to raise sage from seed, but be prepared to wait. Sow indoors in March (potting compost is fine), or in April outside. The plants will grow very slowly and you will only be able to begin harvesting in Junethe next year. Sage looses some of its strength after three or four years, so it is necessary to take cuttings in Spring (5cm or 2in long) to replace the plant the next year. Purple Sage Work in a couple of handfuls of bonemeal to the surrounding soil at the beginning and end of each summer. After the flowers die down, prune the plant to about half it's size. Other than that, leave it to fend for itself. One word of warning - in dry spells, resist the temptation to water, sage prefers dry sunny conditions. Simply cut off the leaves with scissors or pinch off with your fingers as and when required. One plant should be sufficient for the kitchen needs of most households. Sage is best used fresh, although leaves frozen in a plastic bag are an excellent alternative. Dried sage lasts almost indefinitely if stored in an airtight bottle in a dry place out out of sunlight. Simplicity itself - use potting compost (remember to put a good layer of stones at the bottom for drainage) and keep the plant on the dry side throughout it's life. A feed every month with general purpose liquid plant food will be enough. Prune as described above. Sage can be grown indoors as long as it is placed on a sunny windowsill - it will stand direct sunlight with no problems. Choosing a variety of sage is a matter of personal taste. However, for starters, shown below are a few tried and trusted varieties, all of which can be bought online by clicking ( ). Sage Salvia officinalis Icterina - variegated leaves and lilac blue flowers as well as being ideal as the traditional herb sage. Purple Sage Salvia officinalis Purpurascens - great for use as the traditional sage herb, but also with purple foliage. Sage Salvia officinalis - as the Latin name implies, this is the original sage used for centuries to flavour stuffing, meats and even make sage tea. GardenAction recommend CROCUS as your online supplier of sage. We have personally tested many online gardening suppliers and have found out from personal experience that CROCUS offer excellent value for money, reliability and security. When you visit the CROCUS site for sage, enter 'sage' in their search box (shown as 'or find me info on'). Good luck with your new plant! Message: Due to the lack of rain where im from, our natural grown sage in the local fields have died. Im looking to grow some of my own, but the kind i need is the kind that grows Straight Up, With no stems on it, just leafs. In my culture, we call it "male" sage, and we call "female" sage the kind with the branches. If anyone nows what im talking about and can hook me up i would really apprec. Hit me up on my email, cody32_@hotmail.com. Hope to hear back form anyone about this. Thanks! Message: Cutting back will encourage new growth next spring. Spray with water to protect from frost, cover to make sure. Message: I live in Calgary Canada and we are expecting a solid frost ... low of minus 7c tonight (about 25f) We will cover the plants tonight so the leaves do not freeze (hopefully) We would like to harvest tomorrow but not sure whether to pinch leaves only or cut back to about 7 inches as some websites suggest. What is your advice? Message: Hi, I have planted sage in pots and it grow well. But about 3 months later, the plants become wilt form the young leaves and bud. The shoots drop down and wilt. I don't know the reason why do like that. May it be disease or pest? Or may be weather/ environmental condition? I wonder if you kindly answer and suggest for me. Message: Hi, i have planted several sage seeds, few germinated but all of them were killed while they just sprouted as i kept them in pots open to full sunny condition. please suggest how to care sage after sowing. Message: Hi, the information you provided is very helpful. I have a potted sage plant and I figured out from you info that I am over watering it. The root and the stems of the plant seems very dry and the leaves seem to have burnt marks on them but there are new stems growing on top... Please help! Should I cut off the bottom and replant the top? Message: Last fall I bought fresh sage from food store for a recipe, and I had alot left over so i put it in a glass of water in case i want to use it later. It rooted out so I potted it. However, it bloomed right up and now the leaves aren't furry anymore so is it still good to use or i have to dump it? I mean it thrived but just doesn't taste as good as before. Message: Do I trim the blooms off my sage plant before the dry up? Message: I am planning to use sage in my wedding bouquet and in the decorations, is it possible to grow enough of it between now and next summer? Message: I live in Rome and it has been hot and now cooled down. From 33 C down to 18C.